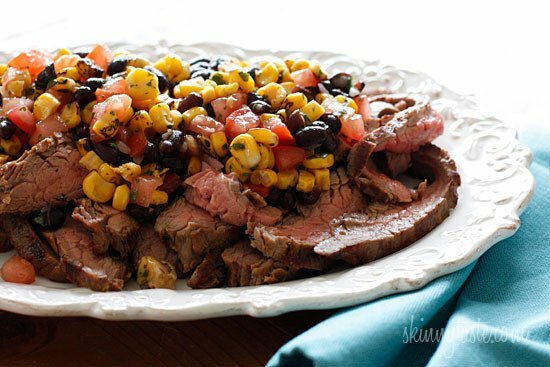 This steak dish has a fiesta of flavors, the flank steak is seasoned with cumin and garlic and grilled to perfection, then topped with a fresh black bean, corn and tomato salad for a quick and tasty family friendly weeknight meal. I love topping grilled meats with fresh salad, a few successful examples of this: Grilled Flank with Tomatoes Red Onion and Balsamic, and Grilled Chicken Bruschetta. In this Tex Mex version, the flavors can be easily tweaked to suit your family’s taste, make it spicy with some chopped jalapenõs, or swap out an ingredient for those picky kids. Enjoy! Season steak with the crushed garlic, cumin, salt and pepper and set aside 5-10 minutes. Combine red onions, olive oil, lime juice, salt and pepper in a medium bowl and set aside a few minutes. 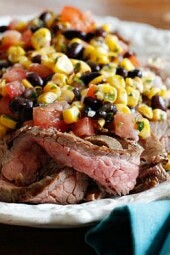 Add tomatoes, black beans, corn, cilantro and set aside. Heat a clean lightly greased indoor or outdoor grill on high heat. 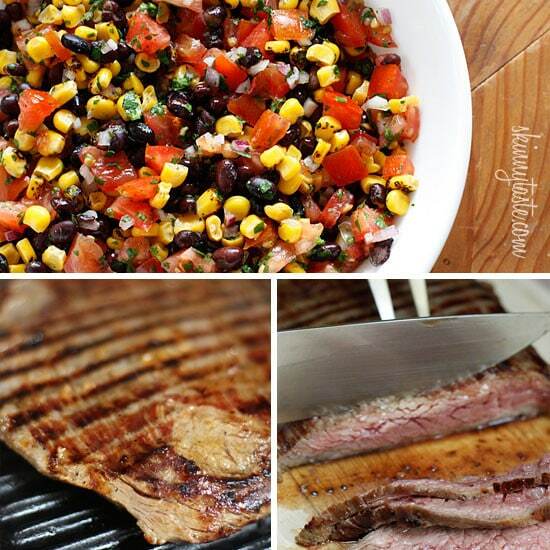 Grill steak on high heat, 6-8 minutes on each side or until your desired degree of doneness. Let the meat rest about 5 minutes before slicing. 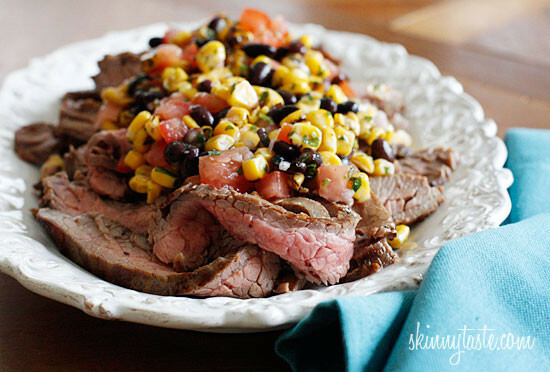 Slice the beef into thin slices across the grain, place on a platter and top with corn, black bean and tomato salad.